David Sinclair of Life Biosciences believes the best way to treat a range of illnesses, from cancer to heart disease to Alzheimer’s, is to attack aging itself. When former hedge fund manager Tristan Edwards resolved to “take on aging” by developing drugs to stretch human life, he scoured the globe for top scientists. His search led to a 2016 phone call with David Sinclair, a fellow Australian whose Harvard lab was testing ways to reduce the aging of blood vessels by stimulating naturally occurring molecules in the body. Edwards was so impressed that, before the call ended, he’d logged on to the Qantas Airways website and booked a flight from Brisbane to Boston for a meeting the next morning. “I couldn’t wait another day,” said Edwards. 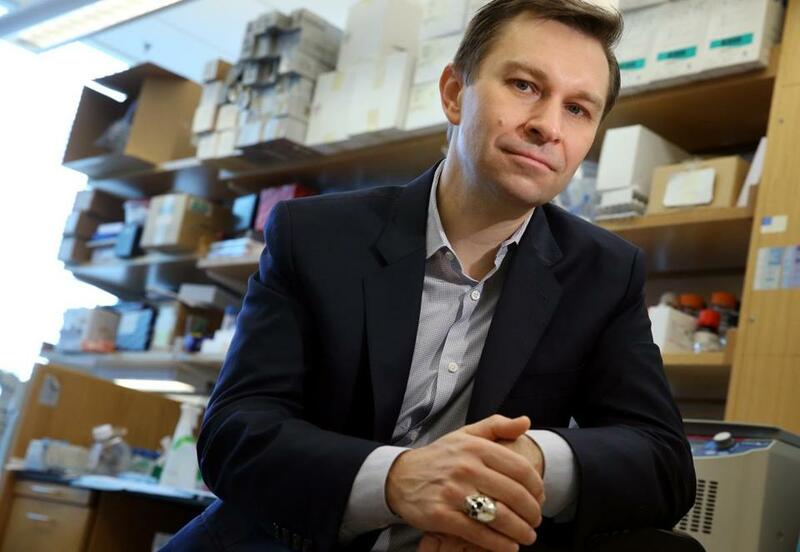 Three years later, Edwards, 42, is cofounder and chief executive of Life Biosciences, an ambitious and rapidly growing Boston company that seeks to boost longevity and dominate an emerging industry of drug makers intent on slowing the pace of aging. Like others in the sector, Edwards and Sinclair, 49, who signed on as a cofounder, believe the best way to treat a range of illnesses, from cancer to heart disease to Alzheimer’s, is to attack aging itself. Nearly three years after their meeting, Edwards has moved his wife and five children to Boston. He’s engineered a “land grab” of leading researchers and patents from around the world. And Life Biosciences, a holding company, has launched seven biotechs — with more in the works — developing therapies to treat age-related conditions such as dementia, infertility, and rare lysomal storage disorders. Each of its startups, called “daughter companies,” is experimenting with different ways to slow the aging process on a cellular level by reprogramming biological pathways. Senolytic Therapeutics is trying to kill so-called zombie cells that generate toxins causing age-related maladies. Sephagy Therapeutics is tackling misfolded proteins that allow waste to accumulate in cells as people age. Jumpstart Fertility seeks to enhance egg cell quality in aging women. Spotlight Biosciences is identifying novel peptides, molecules that are key to aging. Almost all are based in Boston but some are co-located in cities around the world, from Sydney to Barcelona, where their scientists work. “You can change two or three of these [pathways] and impact aging significantly,” said Nir Barzilai, chief medical consultant to Life Biosciences and director of the Institute for Aging Research at the Albert Einstein College of Medicine in New York. At the new Life Biosciences headquarters in Boston’s Park Square, and a 24,000-square-foot lab building it acquired this fall near Fresh Pond in Cambridge, hanging model airplanes and prominent photos of the Wright brothers’ first flight signal the ambitions of the Edwards-Sinclair venture to be a catalyst for a new industry. Edwards said the first drugs could emerge in three to five years, but they will take tens of millions of dollars to develop. Life Biosciences is completing its second funding round with wealthy individuals and family funds that will bankroll the effort, but hasn’t disclosed how much money it has raised. Its largest backer is billionaire Adam Neumann, 39, a former Israeli naval officer who cofounded WeWork, a company that provides shared workspace for startups in about 500 cities around the globe. More than a dozen other ventures — including a pair of California startups, Google-backed Calico and Unity Biotechnology, funded by Amazon founder Jeff Bezos — are competing in the life-extension space. The companies are cropping up at a time when scientists have identified many pathways that influence aging, said Eric Verdin, president of the Buck Institute for Research on Aging in Novato, Calif., which spun out Unity Biotechnology. Verdin said it’s too early to know which companies or drugs will emerge from their efforts. Jay Olshansky, public health professor at the University of Illinois at Chicago, supports such efforts but cautions against expectations they will radically lengthen life spans. Instead, he said, the aim should be “pushing out the red zone,” the time of frailty and disability at the end of life. Sinclair, who continues to run his Harvard lab while serving as scientific sherpa to Life Biosciences, envisions the Boston area becoming the Silicon Valley for longevity science, with Life Biosciences at its center. The coming year could be pivotal for Life Biosciences and its daughter companies as they secure more financing, hire more research talent, and outline their clinical strategy. The founders are cautious about terminology that smacks of pseudoscience. They avoid descriptors such as “anti-aging,” which has been co-opted by the makers of skin creams and vitamin supplements. And like Olshansky, they talk about stretching out people’s “health span” — that is, compressing the amount of time spent fighting illnesses at the end of life. But they also have hopes for increasing life span, eventually. By slowing the aging process, Edwards believes expectations will change. Rather than anticipating living to 75, and grappling with chronic health conditions for the last five years of life, he said, people might one day look forward to living to 100, with only six months of sickness at the end. The field was buoyed in September when the World Health Organization adopted a new code that effectively classified aging as a disease. But the Food and Drug Administration and European regulators still view aging as a natural process, so they’ll only review drug candidates for specific disorders. That’s forced drug makers to focus their research and development, and fund-raising, on diseases such as cancer, or conditions such as infertility rather than aging. But whatever the disease indications in their regulatory filings, longevity scientists are clear their ultimate target is aging itself. A drug capable of reprogramming one of the aging pathways could have side benefits; while it might target infertility, it could also improve memory and cardiovascular health in the person taking it. It may even get them around the track faster.